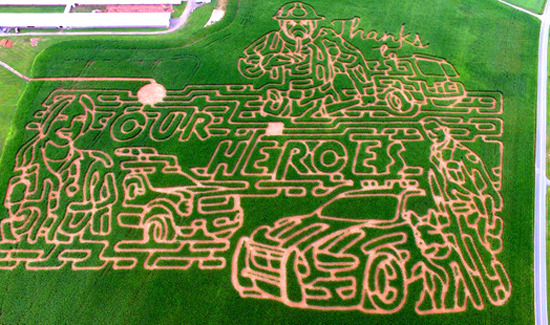 A farm in Frederick County is giving thanks to first responders with an homage to “Our Heroes” in a seasonal corn maze. Lawyer’s Farm in Thurmont — which last year converted its corn maze in tribute to the state and Gov. Larry Hogan’s battle against cancer, using #HoganStrong in its design — has this year given thanks to firefighters, police officers and other emergency medical workers. The farm is located at 13001 Creagerstown Road in Thurmont. The maze — which is discounted for first-responders carrying an ID — is one of a number of features the farm will offer to visitors beginning Sept. 24. Thanks in part to the Hogan maze, the farm raised nearly $13,000 for the American Cancer Society in a fundraiser last year, according to its website.